Next in the lineup of non-Razor LED TVs is the E390i-A1. It's a 1080p Smart TV with a 120Hz refresh rate. That's pretty impressive for 39 inches. The price is just right at less than $450 too. Without the Razor LED design, there are a few inches added to the depth of the set, so it may not be wall mounting worthy. Similar sets like Samsung's UN40F5500 sell for around $630. When it comes to getting a good deal on a Smart TV, this one is it. There are two major differences in E390i and the E390 models. First, the E390i has the Vizio Internet Apps features and the E390 does not. Second, the E390i has a 120Hz refresh rate and the E390 is only 60Hz. Keep these differences in mind as the price of the E390 is much lower. The LED backlighting provides decent picture quality on the E390i. The picture is plenty bright so peak whites are not a problem on this set. Colors are another strong point. The backlight helps to achieve vibrant colors that pop off the screen. They tend to be oversaturated at times, but there may be a desire for that look. Black levels and contrast are lacking and are much better on some of the more expensive LED TVs. Side viewing angles are a bit weak as well. Contrast begins to degrade as you move from the center, but they are getting better in this area. The 120Hz refresh rate is a great feature for a TV of this size. Motion blur and judder aren't terrible on a 39 inch screen, but this feature makes sure they aren't a problem. Sports, action movies, and games are great on this set. Images are smooth and stable even though the camera is panning or objects are moving quickly across the screen. The Vizio E390i-A1 comes with wifi right in the TV so you don't have to worry about finding a long enough Ethernet cable. It connects to the Vizio Internet Apps (V.I.A.) quickly and easily once you scan for an active wifi network. Vizio's smart TV platform gets you to all of the apps that you'll find on a lot of the other smart TV platforms. The amount of apps may not be here, but the amount of usable ones is pretty high. Most of them deal with streaming music and video content, but you'll also find news apps from various sources. You get access to plenty of content apps like Youtube and Netflix. You can also log onto all of your favorite social networks and find news from many different sources. There isn't any fancy gesture control or voice recognition. This can be considered a good thing because voice features on smart TVs are still being perfected. For $420 the E390i-A1 is packed with value. This is an intermediary size, so there isn't much competition from the larger brand names. Toshiba has the 39L4300U and it sells for about $100 more. That's the closest competition for the E390i. 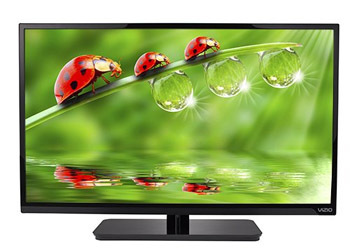 It's got a great feature set and a price that makes it one of the best deals on a 39 inch set.